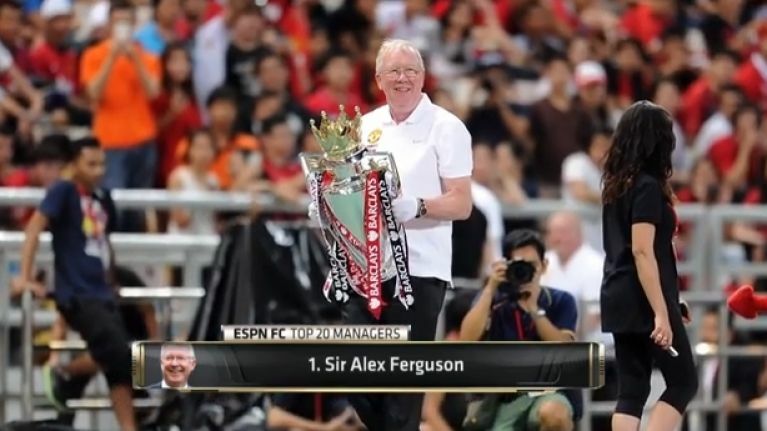 He may be only out of the Man Utd hotseat a few months, but it appears that ESPN have already forgotten what Alex Ferguson looks like. You would think that considering the channel named the Scot as the best manager of all-time and proceeded to show a montage, that the least they would do would be to show images of the man himself. However United trophy-bearer Jim Turner, who does pass more than a resemblance to Fergie, also made an appearance after being snapped during United’s pre-season tour on trophy duties. Turner admitted it came as a surprise when he was being asked for his autograpgh so much while on tour with the squad. “It’s incredible,” Turner told The Daily Telegraph at the time. “So many fans think I'm Sir Alex, especially when we were in Bangkok for the first leg of the tour. Either a poor oversight from ESPN, or a crafty way at getting more publicity.